Discover hidden Assateague. Daily cruise & kayaking to see wild ponies - April - Oct. The Chincoteague Wild Pony Swim & Auction will be held the last consective Wednesday & Thursday of July (swim on Wed & auction on Thurs). The exact time is not mentioned until the day prior to the event (due to tidal conditions). During the pony swim, approx. 40,000 visitors wait along what many say is a "very crowded" shoreline. Large numbers of people wait for long hours in an area that's quite a considerable distance from the swim where the restrooms are located. There are no restrooms close to the swim since it is a tidal marsh. Many people say that the best way for you to experience the wild ponies of Assateague Island is to "Go any other time during the summer, that's when you can see them best on the nature tour". You can see the herds of wild ponies where they live along the island each day, on the nature tour that runs from April thru October. Join the daily pony watching cruise & kayaking with Assateague Explorer. The cruise or kayaking takes you to the most beautiful areas along Assateague Island where you can see various herds of wild ponies every day. If you are still interested in seeing the Annual Pony Swim, there is a special tour to get a much closer view of the Chincoteague wild pony swim (limited seats). If you are planning to visit Chincoteague and Assateague Island, the daily Assateague Explorer cruise & kayaking is an amazing way to experience the wild ponies of Assateague Island in their natural environment. Over 300 wild ponies live along Assateague Island. Ponies can be seen with their foals 7 days a week, April-October on the boat or kayaking tour. Assateague Explorer departs from the Assateague Nature Centre (the closest dock to Assateague with the best access to all herds of horses along the island). See the lighthouse, bald eagles, dolphins, birds and other wildlife along the way. Look at the daily tour photos . The Pony Swim: The Pony Swim has occurred since 1925. If you go, be prepared to wait for long hours with the crowds in the hot sun. During the brief 3 minute pony swim event, the wild horses swim across the Assateague Channel when the tide is "slack calm" so the young ponies, which are born during spring or early summer, are safe from any strong currents. 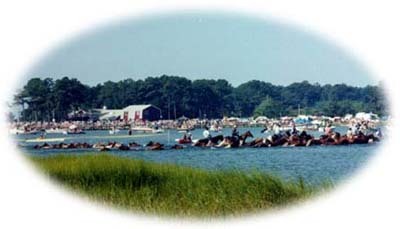 After watching the pony swim, visitors can attend the Chincoteague Carnival. An auction takes place before the ponies swim back to Assateague Island. The Pony Swim is usually broadcast live by the "Good Morning America" show. The Wild Pony Swim is visited by over 40,000 excited spectators. They watch approximately 150 Assateague Ponies make the historic swim. Since Marguerite Henry's famous children's novel "Misty of Chincoteague," millions of visitors with an interest in wild ponies and other wildlife travel to Chincoteague and Assateague to see the islands that Misty and the other wild ponies have made famous. "Misty of Chincoteague" is partly a true story that tells of a young brother and sister that grew up on Chincoteague Island. They attended the pony swim event and purchased an Assateague wild pony they referred to as "Misty". The children raised money to buy Misty by harvesting clams, which is still a source of income for some Chincoteague residents today. Misty was unique in that she had the markings on her side of a map of the United States. Later in life, Misty lived with Marguerite Henry while Marguerite wrote the book "Misty of Chincoteague". A Hollywood movie called "Misty" was made which featured the Chincoteague Pony Swim and many residents of Chincoteague Island that appeared in the movie. Many of the Chincoteague local firemen that "round up" the wild ponies for the Pony Swim, have participated in the event most of their lives. The Chincoteague Volunteer Fire Dept. began to hold it's annual carnival in 1925 with an auction of some of the wild ponies after the pony swim. At the carnival, some of the foals & yearlings are auctioned off before the wild ponies swim back to Assateague Island a couple days later. The tradition began when the town of Chincoteague found itself in need of fire equipment in order to protect itself. Several devastating fires had occurred during the early 1900's, and since Chincoteague Island was isolated from the mainland with no bridges, the town needed protection. Today, most of the proceeds go to the fire dept. for new equipment. The Annual Pony Swim at Chincoteague has now become a national treasure. Many visitors as well as native residents of Chincoteague return to the Pony Swim year after year to take part in this island tradition. The annual pony swim and auction help manage the number of wild horses on Assateague and prevent them from adversely impacting the sensitive barrier island ecology.